feather, usually the primary wing feathers of goose, turkey or swan, with the pointy tip of the feather shaft sharpened to a precise shape for use as the nib. Whilst a person might sharpen their own quill, it required some skill and time. Feathers were first stripped of their barbs and the natural grease coating scraped away. The feather was then hardened by heat treating in sand. A super sharp specialized quill knife formed the pen. Because of the curve of the feather, left-wing feathers are best for right-handed penmen and vice versa. While most quill knives could be used to mend a pen, most people carried a smaller “pen knife” for the task. So most people of any means purchased their quills pre-shaped and sharpened, in bulk. Because the shaft of a feather is permeable, as a quill was used, it absorbed some ink, and became softer, eventually getting too ‘squishy’ to be used to write. At which point it was wiped, and set aside to dry, and harden again. A long letter might involve the use of multiple quills. 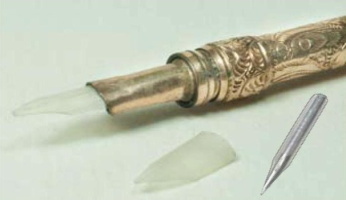 There were also ‘quill nib’ pens – pens made of metal, as a holder for a short nib cut from a quill. A quill nib in a nineteenth-century gold-plated penholder. Also shown is a far more durable steel nib, mass produced in Birmingham, England, starting in the 1820s. There were also early fountain pens available, which used quill nibs. These were very expensive (2 pounds, which might be a months wages for a worker) and there fore not available to many people. Pencils were around from the 1500s, but were not necessarily cheap! Sometime in the 1560’s (the exact date is unknown) a chance event occurred which became the turning point in the development of the modern pencil. Local lore tells of a fierce storm In Cumberland, England, which uprooted a large tree where shepherds discovered a strange black substance clinging to its roots. The locals quickly discovered this to be very useful for marking their sheep, and then gradually its application for writing was developed. By the end of the 16th Century graphite was well known throughout Europe for its superior line-making qualities, its eraseability, and the ability to re-draw on top of it with ink, which is not possible with lead or charcoal. The substance was initially called Wadd, and also became known as white lead, black lead, bleiweiss, grafio piombino, bismuth, and plumbago. The Borrowdale deposit remains the only large scale deposit of graphite ever found in this solid form. The technique for encasing the graphite in wood emerged from the woodworking craft of joiners, with the original process involving cutting a lengthwise groove into a strip of wood, gluing strips of pure graphite into the groove one against the next until it was filled, sawing off the protruding pieces to flattness, then gluing a piece of wood on top to cover the wadd. The wood assembly could then be used in this square shape, or shaved to a round form. So – making pencils took quite a bit of fiddly labour! There were no automated machines for creating the pencils until the 1860s. Next time you read a regency story, and the character writes a letter, or draws with a pencil, pause a moment an consider just how wealthy they are to be able to afford both the paper and the pens or pencils! Love your tidbits, Arietta. They are always enlightening. I knew the information about the quill pens, but not pencils. Since my last book, The Forbidden Valentine, involved so many letters, I’d like to include this info in my next Newsletter, with a link and your permission of course! Yes, approved to include this in your newsletter.